Skin tags are small growths on the skin. Acrochordon is the term which is generally given to them. They resemble the color of the skin. Occasionally they are found to be a little darker than the skin. Skin tissues named as stalk or peduncle are the ones that attach the tags to the skin. Skin tags are frequently seen in people. It is seen in more than fifty percent of the population all over the world. Middle aged people are more prone to getting skin tags. The constant friction of the folds of the skin are the main reason of its formation. Thus they are more frequently seen in people who are overweight. 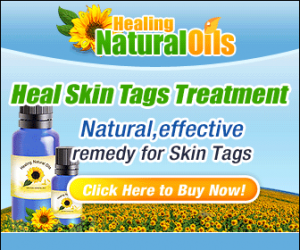 Skin tags are usually not harmful in any way. Nevertheless they are not very good to look at and the confidence of the person having it usually has a negative impact. Because of this people are often worried about how to remove skin tags. They can be easily eliminated by using one of the various options available. One can choose the option they find most convenient for them. One can go to the doctor to get the tags taken away. Cutting and freezing are the two most common clinical methods used to remove tags. Having said that, getting a tag removed is regarded as a cosmetic problem. Because of this majority of the insurance companies do not take care of it. Consequently the person choosing to go for the surgical methods of removal need to pay the bill themselves. Removing the skin tags at home is usually preferred by many people. This is due to the fact that they are not as costly as the surgical techniques used to remove tags. Also they can be done at the comfort of home. The one that is most commonly used is the tying of the tag. The tag is tied with the help of a piece of dental floss or a string. This cuts off the blood supply to the tag. The tag thus dries and falls off. Depending on the location of the tag help may be needed to tie it. This method is usually not preferred by the people who have tags present on the visible parts of their bodies. One may cringe on reading the next method however it is the one that is usually practiced. It involves cutting off the tag with the help of scissors or nail clippers. There is however loss of blood associated with this method. Once the tag is cut, the wound should be properly cleaned using cotton and an antibiotic ointment should be applied on it to avoid the formation of infection. It is required to sterilize the equipments that are used to cut off the tag before using them. They can be disinfected by using alcohol. A tag is not likely to reappear in the same place after it is removed. In the event of the occurrence of such kind of a thing, one should immediately see a doctor. Also irrespective of the remedy used to remove the tag, it is essential to take proper post removal care.